As another season of delicious excess draws to a close, it’s time to think about starting fresh in the New Year. Practitioners of Ayurveda — an ancient Indian system of health that emphasizes fruits, vegetables and other healthful lifestyle choices — believe that bitter foods, such as bitter melon, detoxify the body and aid digestion. Preena Chauhan, who teaches Indian cooking in Oakville with her mother, Arvinda, and sells spice mixes with her brother Paresh, will be explaining the six tastes that make up every Ayurvedic meal — from sweet, salty and sour to bitter, pungent (chiles) and astringent (raw fruits and veggies) — at her next class in April. The bitter melon, also called bitter gourd or karela, comes from the cucumber family and is revered in much of the world for a long list of purported medicinal properties. Believers say these include cleansing the liver, regulating blood sugar, relieving constipation and gas, curing colds, high cholesterol, cancer … you get the picture. North America may be the only place it’s not popular. 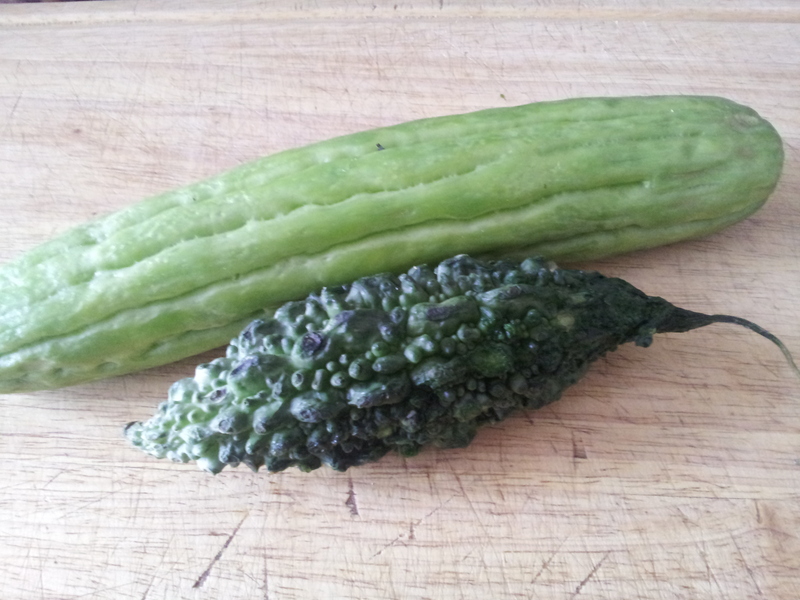 There are two varieties of the green squash sold locally. The long, light green Asian or Chinese bitter melon with deep ridges is beloved in Southeast Asia and the Caribbean and is widely available. The dark green, nubby-skinned, prehistoric-looking karela (ka-RE-la), which I found much more bitter, is a staple in central and South Indian cooking. Look for it in specialty stores. To disguise its bitter flavour, which even Chauhan finds daunting, Indians often cook the darker variety in a dry curry with peanuts, coconut, onions, even sugar. Available year-round, and plentiful in summer and fall. Both varieties should look and feel fresh and firm. Choose karela with lots of green nubs. Bitter melon spoils easily. Wrap individually in paper towels and refrigerate in a plastic bag up to four days. The Chinese or Asian version is coming in from the Dominican Republic, while the South Asian version is grown in the U.S.
One day we may have a local supply of both in the summer. Peeling and removing seeds is optional. 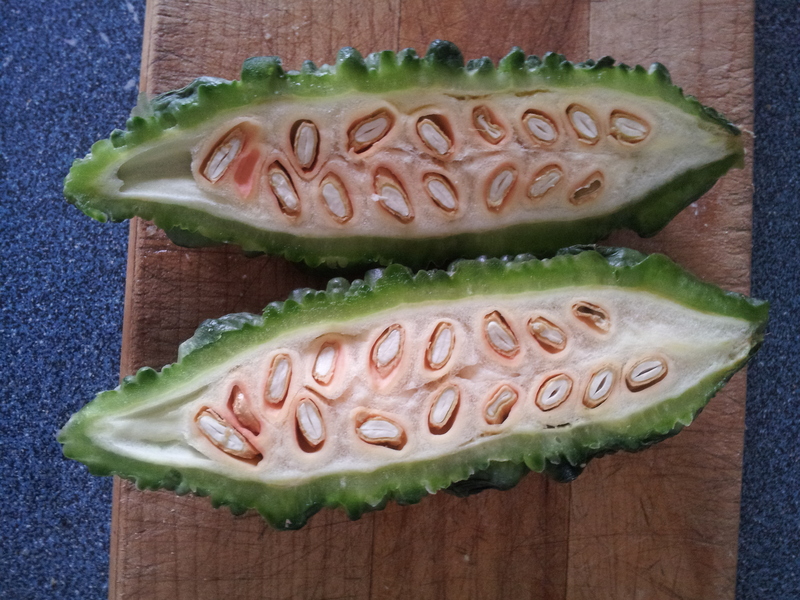 Cut in half lengthwise, scoop out seeds and spongy core with a knife or fingers and slice the green skin crosswise. Aficionados from India to Trinidad soak bitter melon in water overnight to extract some of its bitterness. Substitute bitter melon in any zucchini recipe. It keeps its shape well and infuses the dish with bitterness, for better or worse. Deep-fry, sauté, stir-fry, braise, steam or bake. Look for bitter melon in Chinese soups, steamed with black bean sauce or sautéed with soft rice noodles and pork. In India, karela is often pickled. The helpful connoisseur at BJ supermarket on Gerrard St. E. — he’s a native of India’s Rajasthan state — enjoys it stuffed with spices and deep-fried. Vietnamese cooks stew the melon for the Tet New Year, Jan. 30, to remind diners of the “bitter” conditions of their past. In the Philippines, bitter melon is stir-fried with eggs and tomato, or with ground beef and oyster sauce. Many cultures drink it as a juice or tea to aid digestion and cure what ails you. 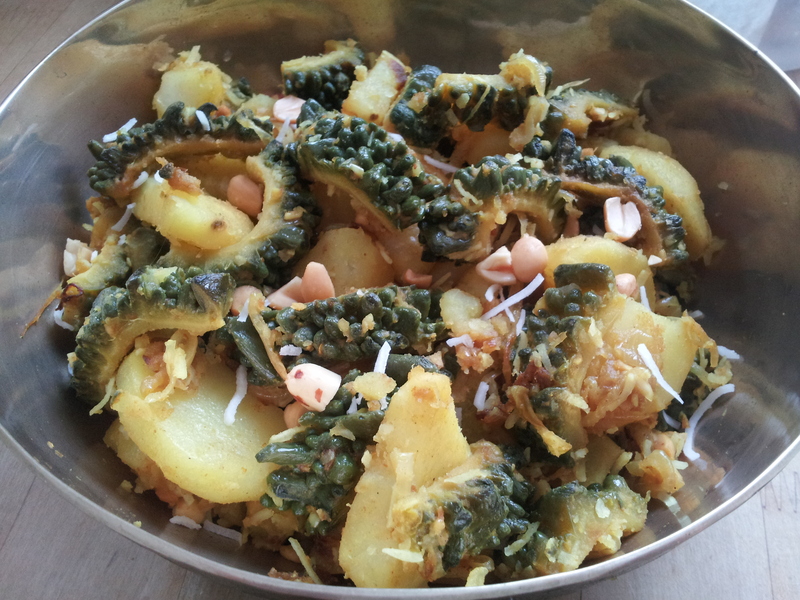 The bitter flavour is softened somewhat in this surprisingly delicious South Indian side dish adapted from Preena Chauhan. For a complete meal, serve with lentil soup (dal), boiled rice and whole wheat chapati flatbreads. Slice squash lengthwise, scoop out seeds and spongy pulp and slice crosswise about half inch (1 cm.) thick. In heavy-bottomed pot, heat oil on medium heat. Add sliced melon, potatoes and onions. In small bowl, mix sugar, salt, cumin, coriander, garlic, ginger, chili powder and turmeric. Sprinkle spice mixture over vegetables, stirring to mix well. If you like, substitute the spices, from cumin to turmeric, with 1 tbsp (15 mL) Arvinda’s Curry Masala. Reduce heat to low and cover pan. Cook 20 to 25 minutes, stirring once or twice, until potatoes and gourds are soft. Gently stir in peanuts and coconut and continue cooking several minutes to blend flavours. Transfer to serving dish and garnish with cilantro.